Austin, TX, WPH Press, 4/2/17- Austin, TX hosted the 2017 Southwest Regional Handball Championships at the University of Texas’ Gregory Gym, featuring nearly 100 players from Texas, Missouri, and Kansas. The Men’s Open singles field was highlighted by top 32 Race 4 Eight pros Adam Bernhard and Memo Pallares, while the Women’s Open singles field featured 2017 USHA Women’s Classic finalist Jennifer Schmitt, Missouri’s Mikaila Mitchell, Texas’ Amy Gross, and Texas’ Kara Edwards. Bernhard was seeking his third consecutive Southwest Regional title in his third finals match-up with Pallares in the past six months. 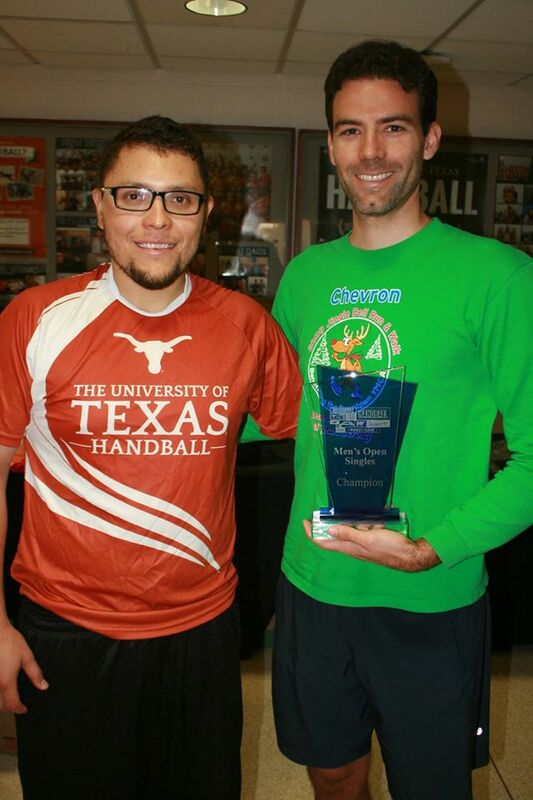 Bernhard and Pallares split their previous two finals encounters and the Southwest Regional Handball Championships would serve as the rubber match between the Austinites. Bernhard was the aggressor throughout the final, emphatically winning his third consecutive regional title in two games. “It seems like Memo was a step slow today and I just felt in control the whole time,” stated Bernhard. Top-seeded Jenny Schmitt used her experience to cruise to the final with decisive victories against Gretchen Gregory and Kara Edwards, while third-seeded Amy Gross stunned Missouri’s Mikaila Mitchell en route to the final in the bottom bracket. Schmitt was able to control the action against Gross in the final, using her deadly left-handed fist passes and fist kills to keep Gross off-balance.